Examined by Professor Alan Brown (The University of Warwick) and Professor Philippa Levy (The University of Sheffield), awarded November 2013. The ideas presented in this thesis have been developed through my work with a large number of people over the past 10 years and I am very grateful to them for the many conversations I have had. In particular, I would like to thank the team who worked on the Ultraversity project and Stephen Heppell for the fantastic opportunity to lead it. Oleg Liber provided me with an opportunity to take the ideas developed by the Ultraversity project a stage further. I thank him for this and for the introduction he gave me to Cybernetics and the Viable Systems Model. I would like to thank Richard Millwood who has been a co-conspirator on projects that make up this thesis and a supervisor whilst writing it up. I would also like to thank Dai Griffiths for his supervisory work knocking this document into shape, and Bill Oliver for introducing me to Disruptive Innovation! Lastly, thanks to Joy for proof reading and for giving me the support and time to write this work up. This section outlines my work and life experience that has shaped my beliefs about learning and teaching. My years before work can be summarised succinctly as a rural upbringing, educated in a small village primary school followed by a Comprehensive School. This had recently changed from a Secondary Modern School in the old Tripartite System of Eleven Plus examinations. Reflecting back, with a few notable exceptions, this was for the most part an educationally barren experience. On completion of my A Levels at Goole Grammar School, I studied Geology at the then named City of London Polytechnic. My working life started out in the oil fields of the North Sea working as a ‘mud logger’ in line with my degree in Geology. This was a short and personally unrewarding episode in my career and resulted in my swapping the oil industry for civil engineering, again making use of my first degree, but this time as a geotechnical engineer. Over a three-year period, I had an enjoyable time and learned at lot about the civil engineering business. However, for some reason this was not satisfying enough and I felt drawn towards working with people in a developmental or educational role. I think, in part, this was a reaction to my own educational experiences that resulted in me wanting to contribute to giving other people better educational opportunities in life. Without wishing to sound too grand, I believe that educational opportunity is a right for all. As a way of making a change, I gained my teaching qualification in 1992 and set forth as an enthusiastic geography teacher at the Sowerby Bridge High School. The key lesson of the first year of my teaching career taught me how ineffective some schools could be. 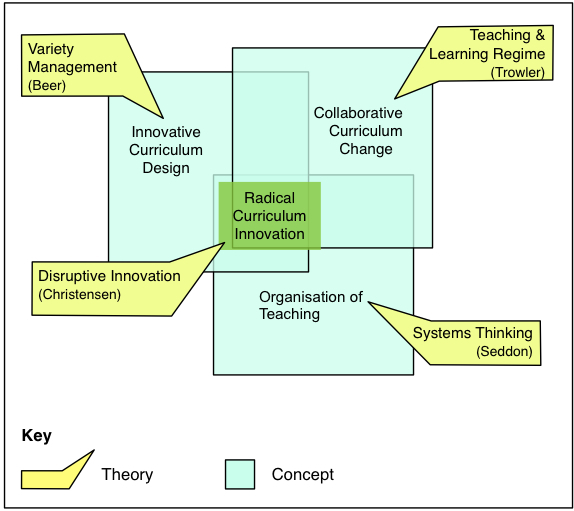 However, in 1993, I joined Brooke Weston City Technology College (CTC) in Corby, an initiative by the then Secretary of State for Education, Kenneth Baker, to ‘transform’ the education system to make schools more like the workplace. It was not a philosophical decision to join a CTC, at the time it was an initiative that was very politically charged; for me it was about job security. However, it turned out to be the single most important formative experience in the development of my values and beliefs around learning and teaching. with the support of teachers, learners can, from an early age, identify their own personal learning trajectory. These ideas have informed the subsequent work that forms the basis of my PhD claim. Being a new school, the Principal of the CTC was able to establish a strong ethos amongst students and staff alike, and embed teaching practices that included team teaching, inquiry based learning, differentiation through outcome, and the use of emerging Information and Communication Technologies (ICT) to underpin these approaches. To set this in context, the school was designed for flexible group working and, from 1993 was equipped at a high ratio throughout with Macintosh LC III (Performa 450) computers boasting colour monitors and the integrated ClarisWorks 2.0 productivity applications. In 1996, this was followed by the arrival of Internet connectivity that allowed access to resources on the World Wide Web. All of this had a big impact on my thinking about learning and education and the affordances that ICT offered by way of allowing a greater range of ways for learners to achieve. Around this time, I began a part time Masters in Education at the University of Leicester. Reflecting back, this was the start of a process of moving my perception as teaching as a craft to a more informed and research led theoretical understanding. In August 1998, another important milestone marking development in my professional life came when I joined the Tesco SchoolNet 2000 project, run by the Ultralab research unit at Anglia Polytechnic University (APU), through a secondment from the CTC. The job itself required me to support schools in the East Midlands in getting school children to undertake inquiries, linked to the National Curriculum and then publish them on the web through a form based interface – not dissimilar to the now familiar blog. As this project drew to a close in December 1999, I was fortunate to be employed by APU in the Ultralab on the Talking Heads project, as a part of the establishment of the National College for School Leadership (NCSL). It proved successful in offering new forms of frequent access to knowledge for headteachers and senior managers in schools who, because of their busy schedules, were unable to readily make use of face-to-face courses that would have met their changing needs. My role in this was initially as an online facilitator of communities, and then as one of the project managers where I had a strategic input, including negotiating with the NCSL on a wide variety of online initiatives and coordinating the activities of the facilitation team of around 20 people until the end of 2003. This was my first experience of working in online communities to support learners, who were educational professionals, on both formal programmes and in non-formal communities. The enduring memory of this experience was the difficulty in making the potential value of online communities a reality. The exception being when there was a clear purpose and requirement to participate or where there was a high profile event and limited activities. These reflections were sharpened by the continuation of my Masters at Anglia Ruskin University, culminating in 2004 with a dissertation, presented online, which was, ‘An enquiry through personal experience into new technology and an alternative approach to MA dissertation’. This was based on my work-practice at the time and provided a starting point for the central premise of my PhD thesis that, ‘work can form the basis for learning, which can then be accredited by Higher Education’. What followed were three other significant projects that form the basis of my claim for PhD by Practice between January 2004 and July 2012. My motivation for undertaking the PhD was that I wanted to gather my experiences of projects in different contexts into a credible body of thought, that has been critically evaluated and reflected upon. This is to consolidate my knowledge and prepare me for a continuing professional and academic career.